You’ve made it through another week – congratulations. Now it’s time to pretend like you’re actually being productive at work while you nail down your weekend plans. Reading this week has been a little intense, and the stack next to my bed just seems to grow larger. 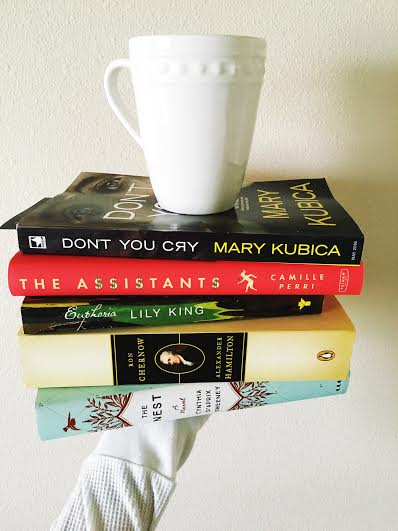 This week I was able to get through The Assistants by Camille Perri and Mary Kubica’s newest, Don’t You Cry. Reviews up next week – so be on the lookout. Presently working my way through Alexander Hamilton and The Nest while finishing up Euphoria. Stay tuned, reviews on those coming your way too. I have some exciting news that I’ll be sharing on May 31 – so mark your calendars to check back on that day. The Man Booker International Prize announced The Vegetarian to be this year’s winner. The NY Times did an article here. Maria Semple’s new book, Today Will be Different is coming out in October! You know I’m a huge fan of Where’d You Go Bernadette so I’m incredibly excited for this upcoming novel! Buzzfeed has come up with yet another list of 18 books to read this summer. Number 1 is currently in my TBR pile.